Portofino is so quintessentially Italian, so synonymous with the Italian Riviera, that it's hard to imagine that at one time it was actually part of France ... but it was! From 1805 to 1815 that feisty little self-proclaimed "Emperor" Napoleon Bonaparte decided to annex the entire region into his empire. Originally named Portus Delphini for the abundance of dolphins in the sea around it, Portofino had been under the rule of the Abbey at San Fruttuoso -- over the ridge of the promontory -- for over two centuries. Then it was annexed into the Republic of Genoa in the 12th century, followed pretty much the history of the Ligurian region, and then Napoleon got it for 10 years, then it went back to Italy. It was primarily a protected little fishing village until the 1950's, when one or two of the beautiful people found it, told their friends, who told their friends and so on. And then some friends told the paparazzi and the rich and famous moved to the hills and cliffs above the sea. The town sits on a tiny bay within the Gulf of Tigullio; pastel-colored buildings rim the harbor while the verdant land surrounding it rises almost vertically. It's a naturally beautiful environment, so much so that the promontory to the north of the village has been designated a national park, complete with paths and trails for all to enjoy. The sea surrounding it has also been declared a national park and a diver's and snorkeler's haven, where red coral grows and flourishes. A bit further out at sea is the "Cetacean Sanctuary," where whales and dolphins congregate peacefully. It's La Dolce Vida for everyone: fish, fowl and Homo sapiens. The yachts that line the harbor give one a sense of what the village has in store -- aside from the beautiful ancient buildings with their trompe l'oeil facades, the stunning backdrop of sapphire-colored water and scarlet bougainvilleas trailing down the mountainsides, the slight scent of pine and olives perfuming the air. There's Louis Vuitton! Ferragamo! Gucci! There's Cartier and Hermes! There's a cafe where for a cool $10 you can buy yourself a Coke or a cup of coffee! Oh, all of these and more are within view, but it's the natural beauty of the place that can make you breathless. If you're in Portofino in mid-summer, you're likely to be shoulder to shoulder with hundreds of other tourists. Do your exploring early and come back to the village in the afternoon when the crowds thin and you can actually see what all the hoopla is about. You'll be hooked. 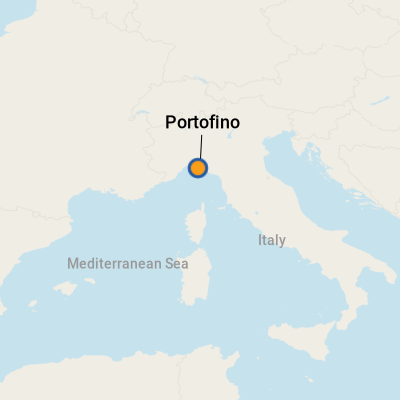 Portofino is a tender port. Tenders arrive at the yacht moorage in the center of town. Editor's Note: Some larger ships visiting the area are required to tender off the coast of Santa Margherita, a little over two miles south, and are bussed into Portofino. Once you exit the tender, you can spend quite awhile gawking at the luxurious yachts that surround you. Depending on the time of your visit, who knows ... you might see the likes of George Clooney or Donatella Versace lunching on the aft end of their multi-million dollar toys (they do that, you know). Otherwise, you can amble around the main plaza (the Piazzetta), up to the church (St. Martin), back down again, and stick your head into any one of the uber-upscale shops that line the alleyways. Armani, Dolce and Gabbana, and Missoni all have retail outlets in Portofino too -- but don't expect steep discounts. It isn't the pickpockets who can grab hold of your wallet; it's the shopkeepers and cafes. Portofino is expensive, from a fridge magnet souvenir to a little cup of coffee. If you are just visiting the town of Portofino for the day, walking is the best way to see everything. If you are going to other areas, you can walk to Santa Margherita Ligure along the seawall or you can take a shuttle bus (arriving every 20 minutes), cab (both available at the main plaza), or by Tigullio ferry (the times vary from season to season). Visit www.traghettiportofino.it, and from there you can catch a train to Genoa, Rapallo and other regional cities. For schedules, see www.trenitalia.it. Currency in Italy is the euro. There are two ATM's near the main square. Banks won't exchange traveler's checks, so you have to go to the post office or to the change booth, located just off the main square near one of the ATM's. For up-to-the-minute exchange rates, be sure to check www.xe.com. Italian, but you're likely to hear English, French and German as well. Cuisine in the Ligurian region of Italy combines the best of the fresh seafood available (in seacoast towns) and the best of the region's special fresh herbs, olive oil and nuts. Pesto was "invented" in this area, the basil leaves being small, light-colored and sweet. The local olive oil is lighter too than in other regions. An abundance of pine nuts, chestnuts and walnuts play a large part in regional fare as well. If there is one specialty that's typically regional, it would be "pansotti," a large triangular-shaped ravioli filled with cheese and herbs or vegetables and covered with a walnut sauce. Most of the trattorias serve these and other regional fare along with the Ligurian version of bouillabaisse, a fish and seafood stew in a tomato base. Ristorante Puny (Piazza Martiri dell'Olivetta 5, Phone: 0185-269-037, closed Monday and Tuesday): Okay, it's true ... we love the name of the place. But beyond that, it's got three things going for it: It's located on the main plaza in Portofino overlooking the yachts, it's a place that locals frequent, and the food is really good. Choose from lighter fare such as pastas and salads or more robust dishes like fish or veal. Take plenty of cash ... a meal will cost at least $35 -- before wine -- and the restaurant doesn't take credit cards. Il Pitosforo (Molo Umberto I, 9, Phone: 0185-269-020, closed Monday and Tuesday): Also in the main plaza is this little restaurant that fronts the yacht harbor. Claiming to be "famous all over the world," the 55-year-old restaurant serving Mediterranean and Ligurian cuisine is owned by the Vinelli family and features regional specialties designed by Chef Marco Vinelli. Trattoria Concordia (4, Via Del Fondaco, Phone: 0185-269-207): For a less-expensive (that's relative in Portofino) alternative away from the seafront, try this little trattoria located next to the police station. It's popular with locals and offers regional specialties and pizza, plus other lighter fare. La Terrazza (Hotel Splendido, Salita Baratta, 16 Phone: 0185-267-801, open everyday): This exclusive Orient-Express hotel is perched cliffside overlooking the town and its harbor. The hotel is world renown for its views and elegant atmosphere; the creations of Chef Corrado Corti are what the hotel calls "extremely flamboyant." So are the prices, where a nice lunch with fabulous views can set you back $200 -- or more! -- for six courses. For about half of that, you can dine on the "light lunch" offered in both the restaurant and around the pool. And by the way, wine is extra. Ordinarily we would have said to buy a bottle of the local olive oil or walnut oil that helps make the region famous, but with airline restrictions on carrying liquids, we have to change direction. Portofino is also well-known for its "macrame lace," which is created by women in the village and surrounding towns as taught by their mothers and grandmothers before them. And you can at least bring home a package of trofie, a handmade pasta that's a regional favorite.